Labo.Art is clean Italian minimalism and showcases the focus of lines, volume, and geometry. This builds an elegant, sophisticated base that creates a comfortable architectural shape. The strong, solid colors of the Labo.Art cotton shirt in white pairs well with any color used in the collection. 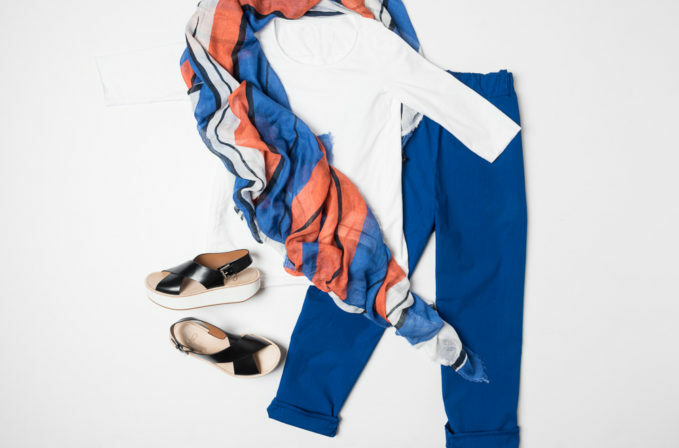 The Labo.Art vibrant true blue cotton pants is one example, but both tones pair with the Som Les Dues multicolored stripe scarf. The bold look is complimented with the fun look of Flamingos platform sandals.